Want to Know Where to Stay in Dublin? We’re Here to Help! Wondering where to stay in Dublin? What part of Dublin to stay in? These are pretty good questions – because we asked the same thing. Truth is, there is no one best place to stay in Dublin since each area offers a unique side of the city. The Irish capital city is loaded with amazing areas – like the city centre – and we’re confident you’ll find an area and accommodation choice that you love! We really like Dublin – Eric is lucky enough to have visited twice (once was during St. Patrick’s Day). If it’s your first time in Dublin, you’ll likely want to stay close to the city centre – but not right in it. Eric did that once and it was fun… but loud! You can also stay by the coast for a seaside city trip! Because there are a few great areas, this guide outlines some of the best areas to stay in Dublin. We’ll walk you through what you can find in each one and provide examples of places to stay in each. Whether you are looking for where to stay in Dublin for the best nightlife, for couples, with family – or even for a solo backpacker – we’ve got you covered! As with most major cities or European capitals, Dublin has loads of different accommodation options that suit all travel styles and budgets. Below, we outline the different styles – from hotels to bed and breakfasts – and tell you what to expect if you book that type in the city! As the capital of Ireland, Dublin is a vibrant, fun city that is full of life. That said, it’s actually pretty small – a little bit bigger than the size of Edinburgh (500,000ish people). As such, there is definitely a good selection of hotels in lots of different areas around the city – from the heart of Temple Bar to the tranquil seaside. In short, there’s a hotel to suit all travel styles and interests in Dublin. If you want to find a hotel in Dublin, check here to get started! You can also keep reading to learn about specific hotels and bed & breakfasts in different areas around the city of Dublin! If you are travelling on a budget or want to experience the “traveller community feel” that Dublin prides itself on, you should stay at a hostel. Like with hotels, there are plenty of hostels in the city to suit different styles. It’s a bit of a myth that all the hostels are for drinking and partying. Yes, this is the case for many hostels in the Temple Bar area – but not all Dublin hostels are like that! 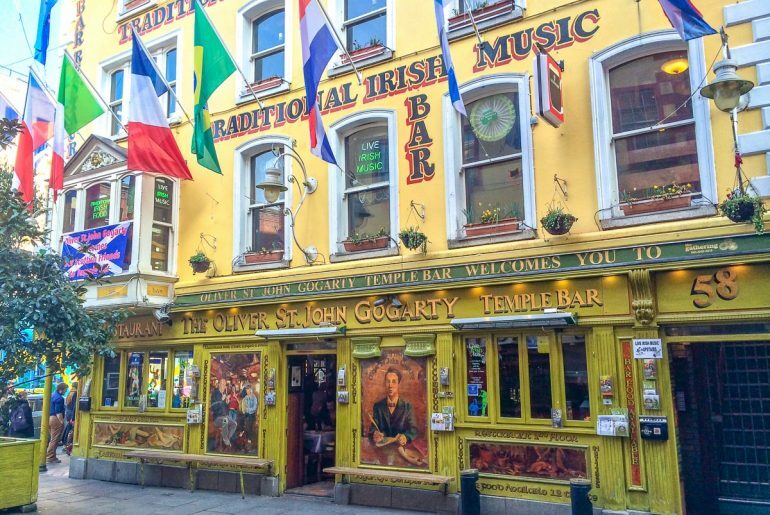 That said, Eric stayed at Oliver St. John Gogarty Hostel with friends and really liked it. It was… in the heart of Temple Bar (the main area for pubs, bars, music, and general shenanigans). So, the location was great but being connected to a live music bar and restaurant, it was – in fact – pretty loud! Nice staff and great pub food, though! If that doesn’t work for you, not a problem. You can check here for great hostels in Dublin to find a hostel that works for you. Dublin is a very international and well-travelled city so hostels are a great choice to connect with others. Another option that you might be considering is renting an apartment or staying at an aparthotel. These are great for longer stays where you might want your own space, cook your own meals to keep costs down, or are travelling with kids. You might even look into an Airbnb. While Dublin is a smaller city, there are certainly apartments available in the city centre – but there are also aparthotels (which are self-catered apartments that also have hotel staff and often breakfast included). We obviously understand why you’d be looking for an apartment (we do the same in certain locations) but we usually try to avoid staying in apartments in bigger cities due to the debate over housing shortages in some major cities and the role holiday apartments play in that. That said, if you are staying for a few days and want your own space to cook and relax, you can check here for apartments and aparthotels in Dublin. Alternatively, you can also look into Bed and Breakfasts (see below), or renting an extra room in someone’s apartment (this can be done via Airbnb as well) – we have done that a few times before. Being a historic city and a smaller city, it maintains a more “neighbourly” feel. As a result of that, compared to other capitals, there are actually quite a few Bed and Breakfasts in Dublin! These B&Bs are everywhere – from tucked away in typical Georgian townhouses to along the Irish coast just outside the city. With welcoming, local hosts with city knowledge and often a hearty cooked breakfast – check here for bed and breakfasts in Dublin! Below, this map of Dublin covers some of the best areas to stay. The General Rule of Thumb: Hotels closer to top attractions/centre are generally more expensive but this is not always the case – you can find a deal in the city centre. At the same time, the coast can be pricey for those sea views! If getting around Dublin is a concern for you, you should know that the city is VERY walkable since it’s pretty flat and not that huge. Of course, if you choose to stay further or want to visit attractions on the outskirts, you can take Dublin public transit around (buses, trains, and trams) to the further areas at the coast like Howth and Dún Laoghaire. Dublin is known to be a very safe and friendly city – but, of course, there are areas that have reputations and some that do not. Some might say that – to speak very generally – north of the River Liffey is “bad” and south of the river is “good”. That is a MASSIVE sweeping and frankly outdated ideal. Many areas north of the river are now considered “up and coming” with shops, cafes, and bars popping up and creating neighbourhoods that are more welcoming and cool to visit. As with any touristy capital, you should keep your wits about you. Watch for pickpockets as you would in any city. 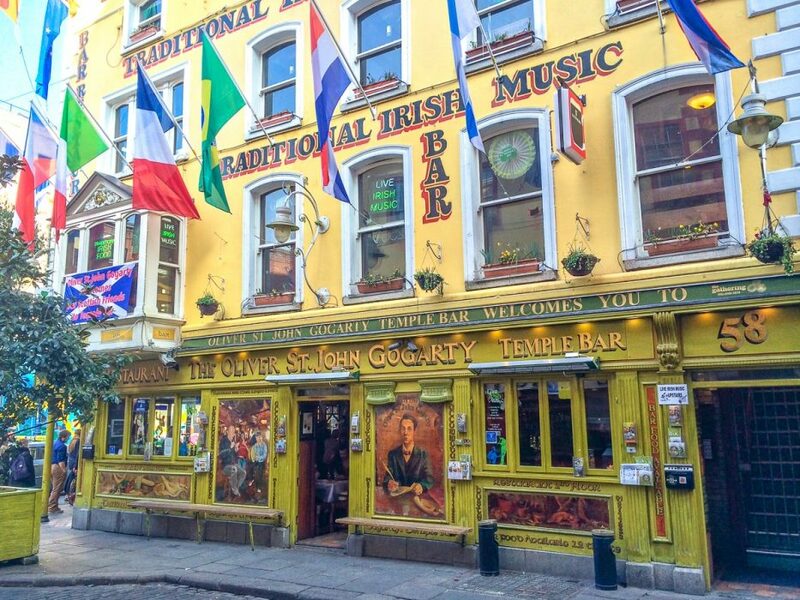 Frankly, the Temple Bar area can be intimidating enough with drunk and rowdy people around but it’s usually all in good fun. It comes with the territory (you’re in Dublin, after all) and how you feel really depends on what you are comfortable with as a traveller. That said, Dublin has a mix of areas. Some “bad parts” have posh areas while even lush areas have their characters wandering through. If you are new to exploring Dublin and plan on seeing the most popular parts, then you will most likely not venture into anywhere that’s truly unsafe. Okay, so now that we have talked about the accommodation styles in Dublin, it’s time to cover the best areas to stay! We’ll give you a brief rundown of the area (including what you can find there) and the overall vibe. Then, we’ll provide top accommodation choices. As mentioned, the neighbourhoods correspond with the map above. To be clear, this is not all the areas where you could stay in Dublin – just a few of the top ones. As we will outline below, these areas all cater to slightly different interests, vibes, and budgets! Here is Oliver St. John Gogarty’s Pub – the hostel is to the right of this photo! As the liveliest, most central, and inevitably most touristy part of Dublin, the city centre is definitely worth a look for a place to stay. Depending on the exact location chosen, however, accommodations can be surrounded by more noise than you are used to. Some people like hearing music in the evening – while others aren’t too keen. To each their own. This whole area is very walkable to the top attractions and good for exploring the history of Dublin, shopping, and having a fun time. Staying in the city centre means that you are undoubtedly close to top areas and attractions along the south bank of the River Liffey. These include Temple Bar, Trinity College, Grafton Street, Dublin Castle, and many more. You can search for accommodation in the City Centre area here. Below are three featured properties for you to check out! Location: Steps from Grafton Street – a lively but not wild area of the centre. If you want a bit of a quieter stay in the historic parts of Dublin, then check out the area known as Georgian Dublin. Popular for the “colourful doors of Dublin” you see in photographs, the area is full of green space, Georgian period architecture, historic townhouses, and overall a more quaint, residential feel. Look for parks/squares like St. Stephen’s Green, Merrion Square, Fitzwilliam Square, and also head south to stroll along the Grand Canal. That said, you are still only a short walk from the city centre and other top areas to go out on the town (like Camden) or visit attractions like The National Concert Hall, The National Museum of Ireland, The National Gallery of Ireland, and more. You can search for accommodation in the Georgian-South area here. Below are three featured properties for you to check out! Featured Amenities: Inner garden/courtyard, Michelin restaurant onsite, infinity pool. If you want to stay north of the River Liffey, you can do that, too. The main street on the north bank is O’Connell Street – deemed to be one of the widest streets in the capital. This street – and the surrounding side streets – area loaded with shops, pubs, and historical monuments to things that have shaped the country’s past. Staying in this area means you are only a quick walk across any bridge (see above photo) into the Temple Bar Area, and a short walk to other attractions on that side like the Jameson Distillery to the west. Top attractions closer to O’Connell Street include Henry Street (good for shopping), The Spire, EPIC The Irish Emigration Museum, The General Post Office, and more. Below are three featured properties for you to check out! If you want to stay a bit farther out of the city centre, check out the areas of Ballsbridge and Donnybrook. Known as the “Embassy Belt”, this area is where you will find many of the embassies of other countries. This area is also closer to the coast than if you stayed in the city centre. So, if the water is what you want to experience, check it out! There isn’t a ton to do in this area but you can get a quieter, cheaper stay and still have easy access to the city centre via public transit. Top attractions in the area are the RDS Main Arena. You can search for accommodation in the Ballsbridge/Donnybrook area here. Below are three featured properties for you to check out! Featured Amenities: Cozy sitting area, friendly hosts, freshly made breakfast options, kettle in each room. To stay in a more residential area much north of the River Liffey, consider a stay in Drumcondra. This area is still well-connected to the centre via train, bus, or a 30-minute walk to O’Connell Street. The area is known for its top attraction – Croke Park, home of Gaelic football and hurling. It’s also the third largest European stadium by capacity! You can be sure that the area gets busy on game days! Up in Drumcondra, its certainly more historic with old pubs and a mix of bed and breakfasts. That said, you can find a hotel if needed. You can search for accommodation in the Drumcondra area here. Below are three featured properties for you to check out! If you are looking for a bit of seaside living, sea air, and the sound of waves, staying at Dublin’s coastline might be for you! While the areas are a bit outside the city centre, they are still well connected via public transit. In no time at all, you can go between lounging on a seaside chair to being downtown having a pint! There are two main areas that you should gravitate towards for the best Irish coastline that maintain a connection to the city centre: Howth to the north of the city and Dún Laoghaire, to the south. Below, we’ve given you options for each! Located to the north (and very much east) of the city centre, Howth is a seaside town that maintains a speedy connection to the city centre (about 25 minutes leaving frequently). Howth is good if you are interested in beaches as well as golfing. There are loads of golf courses up there. Howth also has a gorgeous lighthouse which draws crowds (see the above photo) – it’s no wonder this picturesque area is popular. Located to the south of the city centre, Dún Laoghaire is a beautiful seaside area that makes for a great half day trip if you end up staying in the centre. You can also do this in reverse – staying by the coast for cheaper and then heading into the city if/when you need! It’s only about 25 minutes to Connolly Station via train. Below are two accommodations to check out in Dún Laoghaire. Location: Right on the sea, a quick walk to the train station. And there you have it – a rundown of where to stay in Dublin. In the end, if you remember your budget and know your travel style/needs, you’ll find accommodation in Dublin to suit you. Dublin is a great, vibrant city – so have fun exploring and let us know where you end up staying! We’d love to know!